Dávid Fáber is the founder of nagykovácsi.net [hu], a community news site of Nagykovácsi, a small town in Hungary’s Pest County. The fire that broke out on March 28 on the local Kutya mountain mobilized not only the firefighters, but users of nagykovacsi.net’s forum as well. Below is the interview with Mr. Fáber, who started the Nagykovácsi Citizen Fire Hydrant Task Force. Global Voices (GV): How did you learn about the fire? Dávid Fáber (DF): I live and work in Nagykovácsi, so I have good networks to obtain information. As a founder of nagykovacsi.net, I have written many articles covering many topics since the website was started in 2010. On March 28, an acquaintance called me on the phone saying the protected forest caught fire on the Kutya mountain. By the time I got there volunteers had already located the possible places where water could be obtained to extinguish the fire, and they didn’t allow ‘disaster tourists’ there, they didn’t allow me in, either. By talking to the firefighters and members of the neighbourhood watch I learned that the fire was not the only problem, there was also a problem with the fire hydrants, since among the many local fire hydrants there wasn’t a single one that worked. On the route of the fire fighting vehicles the tenders and syringes could have been loaded but although they should have worked, four of the hydrants on this route were out of order. The only working fire hydrant was in a narrow street, so the rushing firefighters had to stand in line in order to load the water. In addition to this, the old tenders without power steering got stuck in the narrow turn. This freaked me out. GV: It’s strange that so many fire hydrants didn’t work… Were they intentionally damaged? DF: I don’t think so, though there are cases when the cap is stolen from the top. There were three underground fire hydrants nearby, but those didn’t work either. There was no pressure, no water in them. Those would be very hard to damage and it’s not even worth it. The situation disturbed me very much–what if the fire extinguisher doesn’t work in our street either when it’s needed? Then I announced the start of the Nagykovácsi Citizen Fire Hydrant Task Force [hu] on the website. GV: You were inviting people to join some special tactical unit? DF: Exactly! I asked the 400 registered users of the site and the 600 followers on Facebook to locate the fire hydrants in their street and take a photo of them. GV: Was it easy to convince the local residents that they should join a community data gathering? DF: Why the many phones and cameras in our pockets if not for using them for causes that also benefit the community! The photos arrived fast, we covered 60-70 percent of the local fire hydrants in three weeks. With this great enthusiasm the locals not only collected the photos but we started to fill a spreadsheet online about the fire hydrants. We went to town with a core team of five members on bicycles and on foot, and we registered on the spreadsheet the accurate location and many details about the fire hydrants, we took photos from many directions. GV: How can you see if a fire hydrant doesn’t work? DF: You can’t see that, but there are some characteristics that can be checked and those tell if it is maintained or not. To see clear I talked to producers of fire hydrants, to firefighters and I researched the regulations and laws related to this. There are 10-15 spots that even a layman can check. This can be done by everyone. We successfully located all of the local fire hydrants and compared that with the official list which in the meantime I obtained through a freedom of information request. GV: To whom did you file the request and what kind of data did you ask for? DF: The municipality owns 51 percent of the NVK [a local water supplier company], so I filed a freedom of information request and I received the annual reports of NVK with all the annual and biannual maintenance reports, invoices and completion certificates of certain fire hydrants that were set up in 2011. Interestingly, I was not given the right to access the maintenance reports of the fire hydrants, so I requested the help of the National Authority for Data Protection and Freedom of Information [hu], the investigation is under progress. Comparing [the documents] with our database I observed many strange things. For example, in 2010 and 2011 the number of fire hydrants was much higher in the maintenance reports than in the annual business reports of NVK. GV: This could be an administrative mistake, couldn’t it? DF: It could be but quite serious if it is so. The local water supplier company should send the fire hydrant database in the form of an official documentation to the fire service in charge of the area. The Task Force located 240 fire hydrants, but 30-40 of those are in a very problematic condition. Some of them are obviously out of order. GV: Can you determine that as well? Moreover, allegedly this is a national fire protection problem, many water suppliers set the fire hydrants up, but for some reason they forget about the biannual, annual maintenance required by the law. In Budapest, the mayor István Tarlós could negotiate at the acquisition of the [water supplier company of the capital] because, according to a research, 20 percent of the fire hydrants in Budapest were out of order. The National Directorate for Disaster Management could impose a fine for this. Just imagine that at a fire fighting operation the water obtained late or slowly, or its mere lack is a serious danger to people, to private and public property. The situation observed by the Fire Hydrant Task Force was so severe that I decided to turn to the National Directorate for Disaster Management [hu] with the case, since turning to the competent authority is the most I can do as a citizen, they investigate my suspicion and, if needed, they take the proper steps in the case. In order to do this, I sent all the photos, the Excel databases, the related regulations and the inconsistencies found in the maintenance reports to the Directorate. GV: What happened in the case so far? DF: The competent National Directorate for Disaster Management has been very slow-almost using all their 30 days provided by the law­–to allegedly do a general fire protection investigation in which they determined that the documents at the water supplier company are all right. But when conducting random investigations of the fire hydrants, they found some that were last maintained in 2010. So the Directorate ordered to conduct a pressure test on each fire hydrant in the town. I received a letter about all this consisting of five sentences, it informs me neither about who and when will conduct these investigations, nor about whether any fine was imposed. The information it contains hardly reaches the obligatory minimum. I filed a freedom of information request, asking for their lists of fire hydrants back till 2006, so I could compare those with my data. But I also asked them, since it was a citizen initiative, to conduct the whole investigation as transparently as possible, to share all the details that the law allows them to publish. This happened more than 35 days ago and I haven’t received any answer related to this from them. I keep on fighting because I find it ridiculous that 8-10 citizens do a work in a week that fire protection companies conduct for 1-1.5 million HUF, and they send [the results] on a DVD containing ca. 1 GB data to the competent authority. And then a national authority which should serve the protection of the citizens takes so lightly such a case, in which critical infrastructures with a serious role in securing private property, implemented from public money but maintained by private companies, are neglected and carelessly spoiled. This interview, by Csaba Madarász, was published in Hungarian on June 22, 2012, on atlatszo.hu. 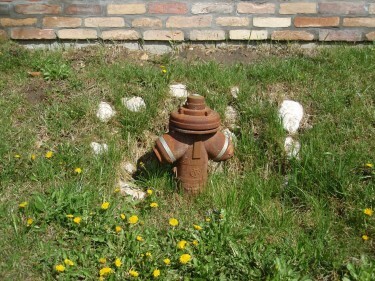 Since then the Directorate has informed Mr. Fáber that their progress is slow because they have to obtain many documents for the investigation, which takes a long time because there are 250 public fire hydrants in Nagykovácsi. By this week, a committee consisting of members of the Directorate and representatives of the water supplier company and the municipality started an investigation in the town. The photos taken by the Nagykovácsi Citizen Fire Hydrant Task Force are published on nagykovacsi.net and indafoto.hu. Originally published by Global Voices Online.